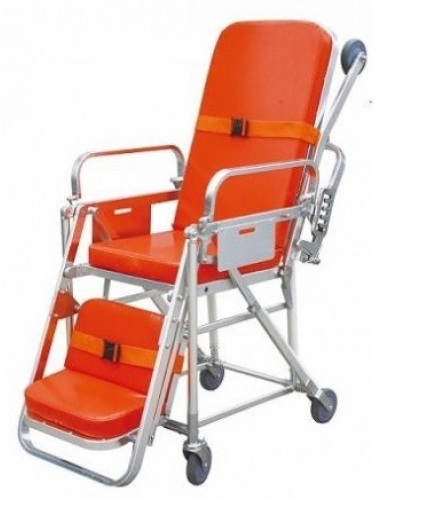 * The stretcher trolley can be converted into a chair. * The ambulance stretcher is quite suitable to transfer the patients in the limited place, such as lift in hospital, ambulance, city road etc. * Made of stainless steel materials. * Bed surface of the stretcher is made of foamed cushion, waterproof. * Back is adjustable which makes the wounded feel comfortable. * With safety lock, it must be locked up when transport the patients, and opened out when get on the ambulance. * The mechanical foldaway legs are controlled by the handles on both ends of the stretcher. * Legs can be folded under the stretcher automatically when loading into the vehicle. * Can be locked by the fixing devices when on the ambulance car. * With two straps, they can bind the wounded on both sides of the stretcher frame.